It was that kind of day on Sunday. Just pie and milk for dinner. Some days are like that. After church, I came home and made lunch for the family. Then I ran the girls around town for the afternoon. When I came in the door around 5:00, pie sounded about as good as anything else. I've found that to be true, too. If I keep eating around that thing that I really want, I wind up eating all of this other stuff, plus the original thing that I wanted! What a fun tradition! I love the idea of having popcorn for Sunday dinner! But I'm guessing you made lunch earlier in the day, right? Nobody ever said you had to have a nutritious lunch AND do it all over again for dinner. We always have a lunch on Sunday and eat-whatever-you-want on Sunday nights. I don't even care what anyone eats--popcorn, Ramen, cookies, pie, cheese an crackers. I'm just not going to cook for anyone on Sunday nights. Good for you for taking the night off! Thank you! I did tell everyone that they could make themselves a peanut butter sandwich, if they were still hungry. I love the idea of a make-what-you-want dinner on Sundays. I'm usually pretty exhausted by Sunday evening. Thank you! In the long run, I think meals all even out. And it was delicious! Sounds fine to me! 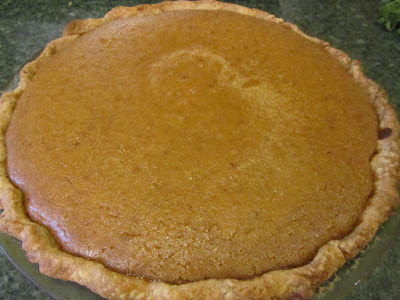 I've always felt like pumpkin is one of the more nutritious pies one can eat. My husband won't go for it, but my sons and I will sometimes have pumpkin pie and milk for breakfast in the fall/winter. Vitamin A in the pumpkin, protein from the eggs and milk...not too bad. Plenty of time left in the day to burn off the extra calories! We actually find it keeps us full for quite a while. About once a week, usually on the weekend, we have a 'fend for yourself' supper. There are almost always a couple servings of some kind of leftovers in the fridge. Usually someone will warm up the leftovers, and others will have cheese/crackers/apples, grilled cheese or grilled ham & cheese, or something else easy like that. Often I'll have toast and milk. I love easy nights like that! I agree with you on how nutritious pumpkin is, as pies go. I make my crusts with 1/5 whole wheat flour -- does that get it any more nutrition points? Pie for breakfast is a favorite of mine, too. If I'm too full after dinner to et pie as dessert, I sometimes will save mine for breakfast. Apple pie is one of my favorite breakfast pies. Toast for dinner sounds pretty good to me, especially after a busy day! I had popcorn for my dinner last night....still eating our way through some of husband's comfort foods, which is fattening and rich on the calories side, so all I felt like eating was popcorn. I haven't eaten that for awhile, so just had to have some yesterday. Last batch I burned in the microwave. I have a tendency to burn my foods because I am not careful in the kitchen. So husband showed me his method of using the microwave...couldn't believe no butter or salt, just plain kernels in a brown paper bag folded at the top and secured with masking tape. I can do that in a pinch, so now I can have popcorn without all the fuss of adding oils to it. Or having to lug out the air popper. I might just donate our fancy cute hardly used air popper from Macy's (before I discovered the treasures I've been finding at thrift stores). Now when I need a kitchen appliance, I look for it at the thrift store on senior day. I'm very glad for you that you took the evening off and didn't feel pressured to cook and eat a meal you didn't want. When I read your "cheap and cheerful" dinners...I'm impressed but also feel it took a lot to make it too. Isn't that true about appliances? I am currently looking for food processors and blenders for one child moving out. Befor eI knew I should start looking( isn't that the case) I saw some pretty sweet ones from the 70/80's . One was like one I had purchased early in my married life. It looked in perfect condition and was way less than what I had paid. Too bad...the timing didn't work out...and I agree that's usually the case. We found our 80s food processor at Savers for $7.50, brand new still in the box, never used (originally priced $15, but 50% on color tag day.) All these years, I never bought a food processor til that day at Savers, what a weird thing to have the opportunity to buy today what I should have bought 30 years ago. So serendipitous!! Recently too, our microwave settings panel stopped working and we discovered how reliant we are on that appliance. Spent almost all day shopping and looking around for the right model/price...then of course I have to peak into Savers to hunt for my special yarns and fabrics for rug making, when my husband saw a fairly new Panasonic microwave model sitting at the front of the store where they have their usually too heavy or big items on display. We saw a similar model at several stores, and the reason the person gave up the microwave according to the note taped on the appliance was because the door was hard to close. Indeed even the store floor models selling Panasonic had this problem. My husband put some lubricant and now the door works so much better. I think it is somewhat of a design flaw, but otherwise such as score for $25 when new models are about $170. I had lots of rules about shopping at thrift stores and usually didn't buy much but craft items, but I'm slowly breaking those rules and finding that having too many rules were to my disadvantage and just a bias in my head. Cooking from scratch does take a lot of time, for me. So if I don't have a couple of hours, at home, in the late afternoon, and haven't started something early in the day, then it doesn't leave me much time for dinner prep. During the week, I can often find an hour in the morning to get something started, then it's just an hour, maybe, to get it all finished in the evening. Yum! Popcorn for dinner sounds delicious! Oh my that pie looks good😀 Fridays were our "leftovers" night . It seems on Saturdays that it would come about 6:00 and enquiring minds would want to know what was for dinner. I said any kind of egg dish you want to make is fine. Sometimes they would take that good idea at lunch when I was out. So I started " claiming" it for dinner by leaving notes. We do a lot of PB sandwiches, here, too. Often it's a lunch thing. If I have no idea what we cold have for lunch on a weekend, then I just tell everyone to make themselves a PB sandwich. It's quick, easy, and even the least experienced cook can make it. And the other night, when it was clear that pie would not be enough for the men in the family, I set out the jar of peanut butter and loaf of bread. It seemed to be enough. Eggs are good, too. When I've had lots and lots of eggs on hand, then that's a good suggestion at lunchtime for weekends, here. Well that sounds like a perfect dinner to me! Although I may have added ice cream! Ha ha! Should I set up extra tables? Or are you fine eating off your lap in the living room? I deliberated on whether or not to add whipped cream. No ice cream here, sadly. Pie for dinner may show up again in the future, now that I have everyone's "okay" on it! I've had popcorn for dinner, too. If i'd had pumpkin pie on the counter instead, i'm sure i would have had that! My favorite pie! Cake for breakfast is quite nutritious, I think -- wheat, eggs, milk -- that's all wholesome stuff! Pie for dinner--I think that seems about right. It was pumpkin after all. well, there is that serving of vegetables in a pumpkin pie, after all! I have eaten cake for breakfast before, so no judgements here! I am so glad that cake and pie are considered good-enough meal foods! I've eaten gingerbread cookies with coffee for breakfast. Maybe I draw the line at candy bars for breakfast. You need to have at least an egg or bacon with a candy bar to make it part of a complete breakfast!